Africa is the undoubtedly a ‘mobile-first’ continent. As well as social and entertainment, services such as banking, health and education are just a few of the areas in which the African mobile ecosystem is already delivering social and economic benefits. The opportunities for mobile will continue to grow with the penetration of Smartphones on the continent and offers new avenues for businesses to interact with its consumers. To stay relevant in a mobile world businesses need to take advantage of all strategies the mobile sphere has to offer. If you're still not convinced of the potential of mobile check out the numbers from a recent study by Ericsson and Mobile Africa. A Pew Research Centre study found that of the seven African countries surveyed, two-thirds say they own a cell phone (feature phone or lower). Ownership is especially high in South Africa and Nigeria, where about nine-in-ten have a cell phone. The same study indicated that a third of South Africans (34 percent) and about a quarter of Nigerians (27 percent) say that their device is a smartphone whilst smartphone ownership is less common in the other nations surveyed, and in Tanzania and Uganda it is still in the single digits. Whilst only seven percent of households in Africa have a fixed line Internet connection more than 65 percent have access to a mobile phone, this study by Ericsson suggests that Internet use on mobile phones is predicted to increase 20-fold. The Mobile Africa 2015 study, conducted by GeoPoll and World Wide Worx, surveyed five of Africa’s major markets; South Africa, Nigeria, Kenya, Ghana and Uganda finding that mobile Internet browsing now stands at 40 percent across these markets – Ghana: 51 percent, Nigeria: 47per cent, South Africa: 40 percent Kenya: 34 percent Uganda: 29 percent. iTouch Messaging Services has been developing and providing a range of bulk messaging solutions aimed at both SMEs and large corporates since 1995 and in that time we've received plenty of feedback from our clients as well as having the ability to incorporate new technology into our systems as it becomes available. In that time we've grown our product range into a full-service mobile marketing offering with exclusive messaging solutions in text messaging, rich media, voice as well as software development services. 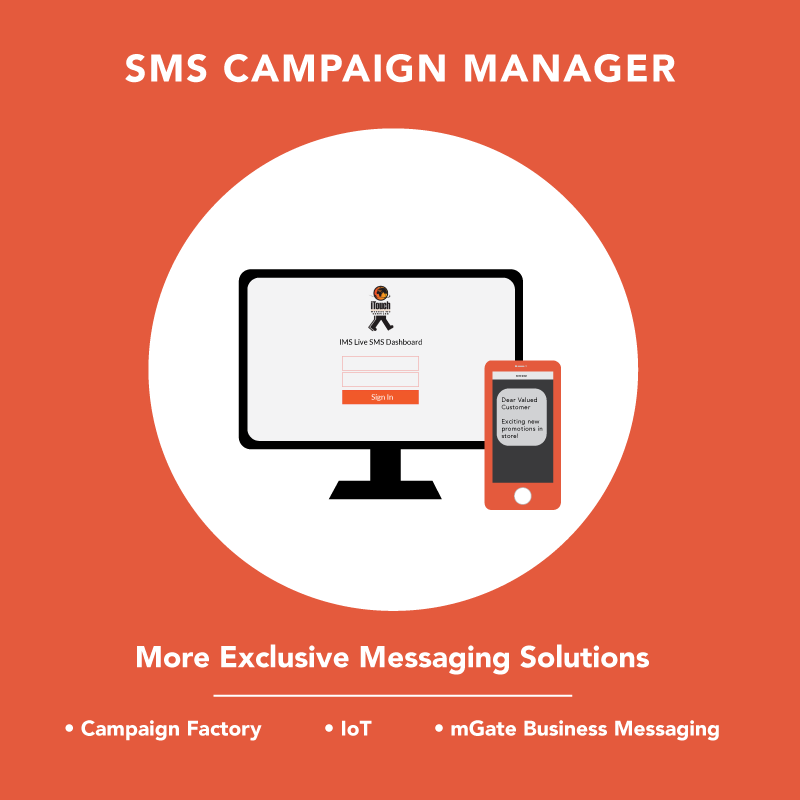 The Campaign Manager is an Exclusive Messaging Solution that enables you to run four different types of SMS marketing campaigns; namely broadcasts, polls, sweepstakes and coupons. This is all with the use of a web-based application, which enables you to manage and control your mobile marketing campaigns. With the Campaign Manager being one of iTouch’s Claim to Fame products, we, and many of our loyal and well-appreciated clients can assure you that the Campaign Manager platform provides an array of benefits and returns. Who is the platform aimed at? The services offered by the Campaign Manager can be utilized by individuals and businesses in various industries. Current iTouch clients who are utilizing the Campaign Manager service include clients within the fashion industry, entertainment industry, retail industry, and the financial service industry; to name but a few. It is available via our web portal or via API solutions. You are able to run multiple campaigns at the same time. You have multiple access points. You gain real-time performance reports. But don’t take our word for it. The Campaign Manager application was rated 5 out of 5 stars based on 517 reviews. That is 100% effective and efficient proven results from the application to our clients. What are the rewards of using the Campaign Manager? With the use of the iTouch Campaign Manager solution, you are able to run multiple campaigns with the use of 2-way Bulk SMS messaging. The Campaign Manager also enables you to tracks every message created, stores every response and actively manages the opt-in status for every campaign. In addition, you are enabled, through the use of our live dashboard, to track your campaigns. This ultimately enables you to refine your direct marketing efforts. With our SMS Campaign Manager application, our clients gained sufficient results when they used the application in their direct marketing campaigns with which they were able to inform their customer base about various promotions, new products as well as running certain polls which enables our clients to receive statistical feedback as they require. Be it on the satisfaction levels of their customers during service delivery or customer satisfaction level with regards to the products offered to their clientele. In addition, the platform enables our clients to communicate with their customer database through utilising it for service messaging, such as thanking a customer for their purchase. This provides our clients with an increase in customer loyalty, ROI and an increase in customer feedback which enables them to identify key areas for improvement and growth in service delivery and customer satisfaction. The Campaign Manager is provided and set up free of charge. You only pay for the SMS messages you send to your customer database. If this and the list of benefits of this service appeals to you, do not hesitate to contact us to gain even more insights into how this service can be of a great benefit to you and/or your business. Campaign Factory is our proprietary management tool for using our version of Rich Communication Services (RCS) but as we like to call it Multimedia-Embedded Message (MEMS). MEMS offers a unique experience that can contain information that is dedicated to a target recipient in a uniquely created URL and is archived for that person for easy reference and backward retrieval so multiple interactions with a single message are possible. MEMS also allows businesses to send multi-media campaigns that contain images, video, attachments and more making your messaging efforts far more attractive and attention grabbing than simply sending a text message. Our Internet of Things (IoT) protocol has the unique ability to create customizable real-time messaging between devices or between a device and clients. If you need messaging solutions between devices that are in-house or in remote locations IoT can achieve just that and more. mGate Business Messaging gateway provides enterprise clients with full-service mobile messaging capabilities and provides a holistic approach to mobile marketing and communication. mGate offers businesses one management tool for SMS messaging, push notifications and email capabilities, including 2-Way messaging (inbound SMS reception), mobile number validity lookups and full in-depth reporting and statistics. If you want to know more about how Campaign Manager and how we can help apply it to your business and business processes then feel free to contact us here.